April 9 is the (Roman) feast date of the minor Cappadocian saint Eupsychius. As martyr to the hated-of-Christians pagan throwback emperor Julian the Apostate, Eupsychius could perhaps be accounted an ironical late victim of the fratricidal family politics that consumed the heirs of the great Christianizer Constantine the Great. When Constantine kicked off in 337, he left three sons of a disgraced empress whom he optimistically hoped would share rulership. What happened instead was that, inside of a generation, practically the entire Constantinian line laid one another in the earth by dint of bloodthirsty dynastic rivalries, leaving only two men standing. And it so happened that those two kinsmen faced one another across late antiquity’s gaping spiritual chasm: one a Christian, the other a pagan. Constantius was the surviving son of Constantine, and regardless his Christian affiliation had secured his initial control of his father’s new eastern capital by unsentimentally butchering the bulk of his extended family including his own uncle Julius Constantius, and Julius’s firstborn son. Two other sons of Julius Constantine, too young for the abbatoir, escaped their brother’s fate and so our future Julian the Apostate grew up under a perpetually dancing Damoclean sword, a bookish philosophizing type enchanted by classical learning — so enchanted that he would eventually, and at first very quietly, apostatize from his substantial Christian education and adhere instead to the old gods. In the fullness of time, the remainder of Constantius’s family succumbed to various civil wars — including Julian’s only surviving brother, Gallus, executed for treachery in 354 in an incident that could very well have claimed Julian as well if for no other reason than proximity. A prolific writer, Julian would later recall that “if some God, to inure my safety, had not ingratiated me with his [Constantius’s] beautiful and excellent wife, Eusebia, I could not have escaped his resentment.” Perhaps the childless Constantius could foresee well enough that, resentment or no, his last relation would be required for imperial policy soon enough. And indeed the very next year, having spent many months mulling over whether to kill him, Constantius instead elevated Julian as his junior co-emperor. The young scholar soon distinguished himself as a surprisingly competent leader and battlefield commander, pacifying Germania and Gaul before, almost inevitably, the two emperors turned on one another in civil war. Julian must have been well-favored of goddess Fortuna whom he will defend in this post, for he won that war before the first spear was chucked when Constantius took ill and died as the rivals steered their armies towards one another. So suddenly, 40 years after the empire had officially gone Christian, it had a pagan ruler — the last pagan ruler it would ever know. Julian was an intelligent and idealistic young man. Taking power before the age of 30, he set a bold course to massively remake the empire in the image of its most admirable anachronisms: living modestly, paring the bureaucracy, debating Senators as their equal instead of their overlord, and — the attempted rollback that would mark his nickname and his reputation — restoring a pre-Christian cosmology to philosophical preeminence. This could have been Julian the Apostate‘s life’s work, twenty or thirty of forty years dislodging Christianity from the official foothold it had only recently attained and creating the groundwork for a pagan-dominated middle ages: fine grist for speculative alternative history, since Julian actually died in 363 in war against the Persians. Having learned from the failure of previous rulers’ persecutions, he deployed instead the devious and modern mechanic of liberal religious toleration, starving the “Galileans” of the galvanizing force of either state backing or state oppression while perhaps setting their orthodox edifice up to splinter over time as various heretical movements began freely venting their rival doctrines on one another. 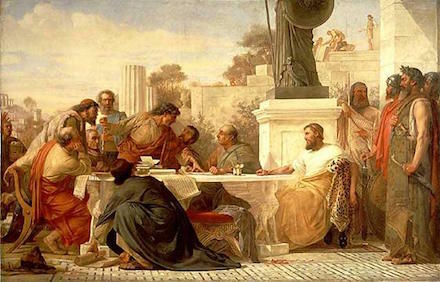 Julian the Apostate presiding at a conference of sectarians, by Edward Armitage (1875). The Christians, who had now possessed above forty years the civil and ecclesiastical government of the empire, had contracted the insolent vices of prosperity, and the habit of believing that the saints alone were entitled to reign over the earth. As soon as the enmity of Julian deprived the clergy of the privileges which had been conferred by the favour of Constantine, they complained of the most cruel oppression; and the free toleration of idolaters and heretics was a subject of grief and scandal to the orthodox party. The acts of violence, which were no longer countenanced by the magistrates, were still committed by the zeal of the people. At Pessinus the altar of Cybele was overturned almost in the presence of the emperor, and in the city of Caesarea, in Cappadocia, the temple of Fortune, the sole place of worship which had been left to the Pagans, was destroyed by the rage of a popular tumult. On these occasions, a Prince who felt for the honour of the gods was not disposed to interrupt the course of justice; and his mind was still more deeply exasperated when he found that the fanatics, who had deserved and suffered the punishment of incendiaries, were rewarded with the honours of martyrdom. It is the last named of these incidents that finally brings us round to our date’s principal. Like Julian himself, St. Eupsychius had no way of knowing that the new, old order would be a transient epoch. In his zeal to resist a rejuvenated paganism, Eupsychius led a riotous sack of a temple to Fortuna (Tyche). The church historian Sozomen gives us the primary-est historical record, and although it dates to several decades after Eupsychius’s martyrdom we can’t be picky when it comes to antiquity. It is said that at this time were martyred Basilius, a presbyter of the church of Ancyra, and Eupsychius, a nobleman of Caesarea in Cappadocia, newly wed and in a manner of speaking still a bridegroom. As regards Eupsychius, I conjecture that he was executed because of the temple of Tyche, then destroyed, on account of which destruction, as has been said above, all citizens of Caesarea collectively experienced the emperor’s wrath, while those who personally took part in it were punished, some with death, some with banishment. Little more than a year later, Julian suffered a mortal wound in battle against the Sassanids. The Constantinian dynasty died with Julian, as did his signature project of Apostasy — a sudden volte-face of that fickle Fortuna whose memory and reputation would persist well beyond the twilight of paganism. The History of Rome podcast deals with Julian in episodes 143, 144, 145, and 146. Lars Brownworth also covers Julian in episode 5 of the 12 Byzantine Rulers podcast. * See L.G. Westerink, “The Two Faces of St. Eupsychius,” Harvard Ukrainian Studies, Vol. 7, Okeanos: Essays presented to Ihor Shevchenko on his Sixtieth Birthday by his Colleagues and Students (1983). hmm The Aztec gods were infamous for their human sacrifices and the Meso Americans for their cannibalism. Most of the other Mesoamerican tribes joined the Spaniards hoping for a better deal. And the Norse gods have been used by the Third Reich. Most of the real Greek and Roman gods hardly played a part during the Constantinian dynasty. The new gods, the Hellen istic Isis among them, were more important while the common people venerated local gods. Julian’s god was the abstract god of neo-platonism, the ruling philosophy at the time with about the same morality as the Christians. Neoplatonism did influence Christianity as it helped describing Christian theology. Pagan intellectuals were neo-platonists and clung more to the old gods as aesthetes for they did not believe in them either. Darned this is a sad story as the Greek and Roman and Norse and Hindu and Shinto and African and Aztec Gods were vastly supirior to the unreal God of the Jews, Christians, Muslims and Mormans. Although, I guess that the monothiestic God could be a cover story for a Parlliment of Greek, Roman, Norse, Hindu, Shinto, African, and Aztec Gods. Constantine acted not as a Christian should and his family even worse. Nevertheless, there are signs that Constantine’s mother, Helena, he had elevated to Empress -her husband had not been Emperor- was not at all satisfied with this because she was a devout Christian. However, Julian was no angel either. He has been admired and exalted as a pagan saint but could be very ruthless too. Although he started out as tolerant towards Jews at the end of his reign he detested Jews as much as Christians. His restoration of paganism was too late as most of the East was already Christian..